Battle Dawn, defined by its own name, its a hostile environment where players either defend their right to independence and conquest or face being conquered. Thus, it is imperative that each Colony build an army for defense as well as to attack. The gateway to this element of Battle Dawn is the Orders button, located at the top-left of a player's screen, just under the radar dish. To start an army, players must first recruit units, which will later be grouped into mobile squads. Recruiting requires the steps outlined in the Recruitment page. Once a number of units have finished their recruiting ticks, they must be grouped into Squads before they can be deployed to other locations (units not in a squad will still defend their Colony if attacked). Details of Squads can be found on the Squads page. Units will heal whenever they are stationary for a whole tick, 1 Health point per tick they are not moved and they heal regardless of the location of the squad. Every unit recruited requires upkeep to maintain. For every 50 soldiers you have (Infantry are worth 1 soldier, vehicles are worth 2, tanks are worth 3) you must pay one worker every time you are given workers. The more units you have, the more they will wear on your population growth. You can use your units to conquer other players and increase your worker growth to outweigh this, or deal with the costs. 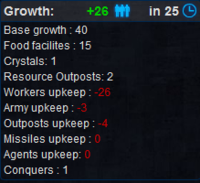 Worker Upkeep = -3 per 50 workers. Outpost Upkeep = -0.5 per outpost (Rounded up). Missiles Upkeep = -1 per missile. Army Upkeep = -1 per 50 soldiers in your army. This page was last modified on 20 June 2013, at 20:43.